It was overcast whilst I prepared AmyJo for cruising and no sooner had we set of a light drizzle settled in. Sod's law states if its dry and overcast whilst moored it will soon rain as you get underway. Nothing for it but to leave the pram hood up again. The rain was sporadic all the way to Appley Bridge Lock with spells of lovely warm sunshine in between. Up to now we had dodged the heavy showers. Chris and Smudge got off to work the lock and low and behold, the heavens opened and a torrential downpour hit us just as AmyJo got into the lock. With no shelter or means to get back on board they both had to stand in the rain. Smudge, bless him, took refuge under the lock beam for what little shelter it offered him, Chris thankfully had her waterproof coat on. As fast as it started the rain stopped shortly after. At this lock there is a side arm on the canal that goes round to another lock now disused and then rejoins the main line below our lock. As we were about to leave the lock nb Ikky Maru came out of the side arm offering to set the next swing bridge for us allowing us to cruise straight through. At Dean lock, domineered by the high rise M6, we pulled onto the water point whilst nb Ikky Maru prepared to enter the lock which was in our favour and doors open. Just as she had got to the gates our water tank was full so we hastily put the hose away and joined them. Fortunately 3 boats were waiting to come down so plenty of lock wheelers this time. It was so nice to have lock partners for once. We had been meeting several boats coming towards us, more than nB Ikky Maru's crew had been used to. They cruise these parts regularly and had not knows so may boats travelling one way. The only reason we could think of is there is a Ukulele festival on Parbold over the weekend and boats were making their way there. At Wigan nb Ikky Maru remained with us through lock 87 but stopped for lunch before the junction. 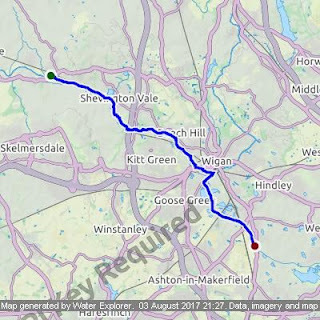 We carried on and this time I made the turn at Wigan Pier correctly without incident. Shortly after nb Ikky Maru appeared again. They had decided to move on further before stopping so we had our lock partners back again. It was getting on for mid day and the forecast winds were beginning to make things interesting as they were now getting quite strong. Still, we managed to keep AmyJo under control quite well. At Poolstock top lock we arrived to find a boat aground in the pound below, the levels really low due to all the boats coming up. Its crew ashore, an elderly lady, seemed to be at a loss as what to do Chris weighed up the situation and opened the bottom gates and one top paddle. After 15 minutes the boat re-floated and managed to enter the lock. After that it was our turn and we descended into the pound. Fortunately for us the action of locking down raised the level further and on tick over I got AmyJo to the bottom lock without problem, however, when Chris arrived all was not well. She did not look right and complained of feeling faint and hot. I insisted she had a glass of water and remain on AmyJo whilst I worked the lock. By the time the lock was ready Chris motored in and felt much better insisting on working the lock herself. We can only assume she was a little dehydrated. She is fine now. There have still been a lot of boats heading the other way. On exiting the bottom lock three boats were waiting to come up. The first cast off and moved off allowing room for me to pick up Chris and Smudge. Whilst this took place the third boat inline nipped round the second and shot across my bows blocking my way to the bank just as I was coming into it forcing me to swerve out of the way at the last minute. Now I have a confession to make. I don't get annoyed often but for some reason this time I saw red and the event really wound me up! Why so much I have no idea but it did. Perhaps the testing run through Wigan did not help. The elderly couple smiled as they got in my way so I scowled at them "Thank you for letting me pick up my crew" in a brash voice, the smiles soon disappearing as they then moved to enter the lock. Stirring up all sorts of rubbish where I could get ashore in their wake. I do apologise, I know.... I know, that was not nice thing to do to the couple but I simply could not help it. Its really not like me at all. To add insult to injury I had no choice but to continue on, unable to get AmyJo into the bank to pick up Chris due to the shallowness. Eventually half a mile further on a narrows enabled me to get in close enough for Chris and Smudge to get aboard. Not before picking up a prop jockey that I could not shake off. To say I was really miffed now was an understatement! We limped on unable to get into the bank for some time so when we got to Dover Lock I called it a day and moored up on the moorings outside the pub of the same name. Down the weed hatch I discovered we had caught a complete, large sized cotton vest, from M&S no less, and a 10 foot length of thick Nylon rope. At least I get quality round my prop :-) The rope helping to wrap the vest tightly around the prop. Luckily it untangled easily and it all came off. In the evening we took ourselves off to the Dover Lock pub for a drink, just in time for the local bingo to start. The pub is not the swankiest of places and quite rowdy but we were made welcome and stayed for a pint or three. The land lady roped me into buying a bingo card for the last game which turned out quite profitable for us as it happened because we won the full house jackpot for the night! Even better, on entering the quiz that followed we came a close second to a team of four, they beat us by just one question. So a good end to a bad day I reckon.